I've been a beauty blogger for about 5 years now and throughout that time, I've read soooooooo many posts, articles, hints, tidbits and generally absorbed as much as I could about being a better blogger. How and Why did I start blogging? I don't know how many of you remember Davis (can I see your hands up girlfriends?). They had these gorgeous and super colourful eyeshadow palettes that you could purchase for just N200/N250 and so many people were using them. I still buy the N50 pencils and they are the truth, mehn! Market women, sales girls, corporate professionals, mothers, sisters....everyone was using them and to me it just seemed that they weren't using it right. I just knew there had to be a better way and so I went on the internet and tried to find ways of doing makeup. For some weird reason, I either didn't find great dark skinned bloggers or their styles didn't appeal to me because I ended up following 3 video bloggers - Aubrey of Fafinettex3, Christine of xteener and Ren of Makeup by Renren. They were my holy grail for makeup looks. Unfortunately, I didn't know then that the techniques they used on themselves couldn't work on me and most of us here due to their mixed heritage thus making all of them monolids, lol. To show you how influenced by them I was, I got the Sedona Lace brush set because of Ren and also won a mascara giveaway on her channel from Glitter Gal which I loved and kept until they were so dry everyone who saw them said I should throw them away. How Did I Become a Supporter of Nigerian Beauty Brands? In the process of not using cheap products while looking for affordable and available products, I stumbled on a thought in my mind that there had to be Nigerian beauty brands. I'd heard about Orekelewa in Uni and thought to myself that there had to be others. Thus began my relationship with Lise, Zaron, Khuraira, BMPro, Gifty's Daughter, Sacred Artistry, Hegai & Esther (who by the way was still a makeup artist when I met her) and the rest of them. I got free products from all of them mainly because it was the first time they were meeting someone who was so interested in 'Made in Nigeria makeup'. The only Nigerian blogger I knew then was Stella and she was all the way in France so I was by myself. Dayum, you need to see the mess I was those days - pictures were terrible, I knew nothing about design, how to arrange content but what I did know was that I needed to start. I won't bore you with the long details though so we'll fast forward. I'm here now, gone full circle and more into myself and my niche than ever before. I can say for a fact that I'm the only Nigerian beauty blogger with a full grasp of what goes on at the backend of a blog. What holds it up, what makes it what it is apart from the pretty pictures and pretty words. This of course has also being made possible by the fact that I've spent all my working years in the Advertising industry and evolved into Digital marketing. I've gotten to know more about what works and what doesn't - how you can have the prettiest site but no one sees it, write great content but no one is reading. I of all people know how frustrating it can be (I left the online space for about a year because it just wasn't working), the horrible feedback, the lack of having a great support system and basically not knowing what to do. I always say that if I knew what I know now when I started, it would be a different story now but God knows best and it is for a reason. 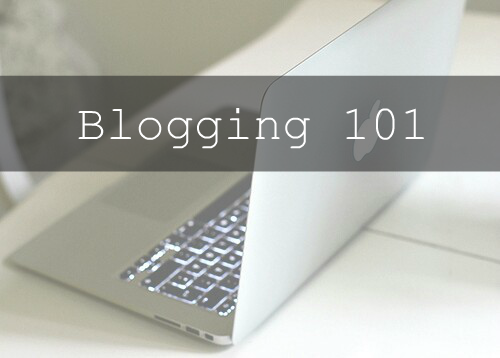 This series is called 'The Nigerian Beauty Blogger - Beauty Blogging 101' but like I mentioned earlier, some of the tips in it can be applied to blogging in any other industry so feel free to share with your friends and even other digital marketers who have no idea how blogging actually works.